Gael Garcia Bernal stars in NO, an epic David and Goliath story penned by Pedro Peirano about a brash young Chilean adman, René Saavedra, who spearheads a campaign to defeat dictator Augusto Pinochet and set Chile free during the country’s 1988 referendum. The film is the final part of a trilogy which director Pablo Larraín began with Tony Manero in 2008 and followed with Post Mortem in 2010. 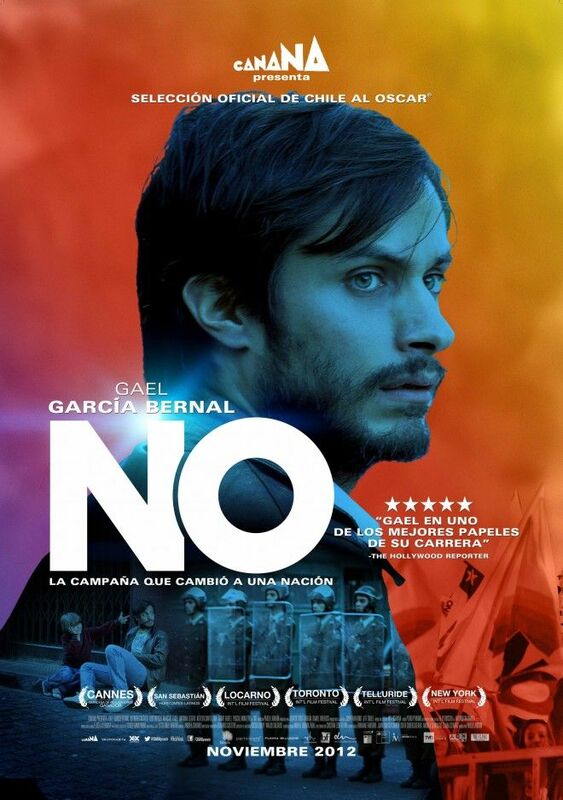 NO has been nominated for an Academy Award for Best Foreign Language Film and opens in theaters on February 15th. Question: Congratulations on the Oscar nomination. What does the nomination mean to you? 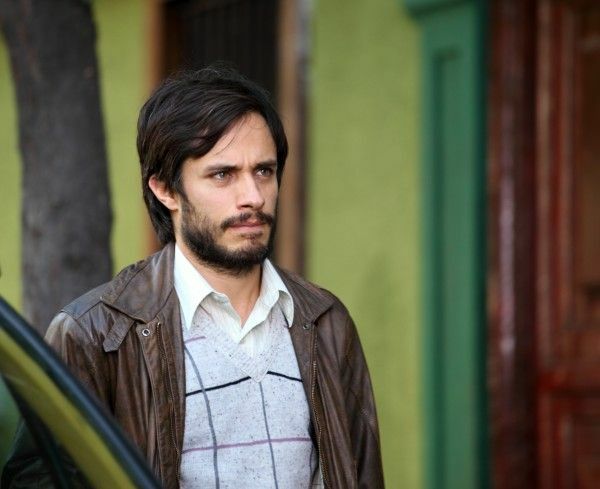 Gael Garcia Bernal: The Oscar hasn’t arrived yet. For the film, it’s a great opportunity for it to be seen in many different parts of the world. It’s almost immeasurable how much more people get to see a film once it gets a nomination in whatever category, especially this one which is perhaps one of the most contested. Let’s call it one of the elite highlights of the Oscars. It’s the best films in the world. Of course, it is subjective. You can’t quantify. There are a lot of good films that are left behind and not nominated. Filmmakers all around the world are making great movies now and to be in this category is a great privilege. Even though it sounds commonplace, because everyone says that just being nominated is the award in a sense, it is quite fantastic that out of 71 countries, this film got a chance to get nominated. In a way, it is not only representing Chile but all of Latin America, because we all feel like that. I feel like that. We’re very happy that this happened and let’s see. Hopefully, some surprise will happen that day. In a way, do you feel that you are also nominated for being in the movie? Bernal: No, I feel it is the work of everyone, but I think specifically the person who is nominated is Pablo. Absolutely. It’s his. Pablo Larraín: No, I think it’s everybody. The movie was made by a lot of people. Bernal: But I think it’s him. Can you comment on how the film resonates with your own social conscience and political sensibilities and if that was part of what attracted you to this project? Bernal: There is a chance always, and you cannot dissociate politics from any social interaction. Any exchange of ideas involves politics. It’s very difficult to dissociate from that. Also, in Latin America, we have a different semantic perhaps where politics are very much on the surface, all the time. The reason why I mention this is because in the United States, politics seem like something separate from daily life. It’s like, “I’m going to do politics and then come back.” In Latin America, in a way you’re always doing politics in every single action in your mundane existence. All these stories carry that within them, and therefore it is a layer that we also play upon, and this one in particular is a very political story. It’s one of the most full on political stories that I’ve ever had a chance to participate in. This was a great chance to play around with brainstorming and an investigation and an introspection on what democracy means and what happened in those days in Chile, not only on how it shaped the Chile that we live in now, but also the world in a way, and how what happened in 1988 was an interesting shift of perspective that resonated in Latin American and throughout the rest of the world. It was really interesting for me to be able to participate in something like this and to play around with it and to jump into it. I was invited into this story that Pablo had in mind and into the filmmaking family that Pablo has as well there in Chile. I was very cordially and cheerfully invited to be there. I wanted to make an analogy with the parties that we had. It was really nice. We had a lot of fun. Is the character of René Saavedra a product of the times in which he lived or is he simply a hero for his talent in this story? Larraín: It’s a combination of both things, of society and the character. In general, I think this character reflects the social and ideological process that the country goes through. I think it’s interesting how Pinochet imposes a social and economic model through advertising and marketing and those tools were the very ones that took him from power. He creates his own poison without even realizing. This character came from a country with a dictatorship. He was exiled and made a life in Mexico and then he came back to Chile, but instead of putting all his painful feelings from having been in exile into his work, and more specifically into his campaign, he projects a very calm perspective that no one else has, at least in the film. So, in that sense, I think he is a very talented person with the light and brightness to detect the right road to take. 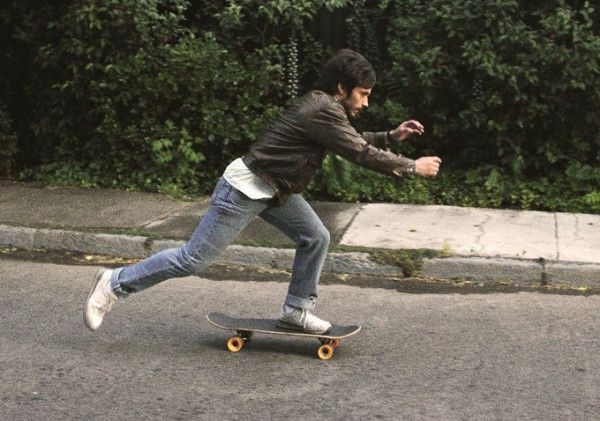 Pablo, the look of the film is very distinct and unique. How did you come up with that lo-fi concept? Larraín: We used a lot of archival footage. When they use that kind of footage, most movies usually do it for a couple of minutes, so it doesn’t really matter that you are shooting in a format that is way different from that. But since one third of the film is archival footage, we thought we would be constantly breaking the illusion for the audience and the audience would be in and out trying to reconnect with our material if we shot it in film or state of the art HD. We started to realize that the best way was to shoot in the same format that it was made which was an early 80’s analog video system, which is completely obsolete and was risky at the beginning. I would lie to you if I told you I wasn’t scared. There was a huge amount of doubt over it, but then, when we started shooting it, it just felt right, not only because it matched perfectly, but also because it created an atmosphere and a tone. We worked with no marks on the floor and the actors could move with more freedom, so we were forced to make the movie using a more documentary style of shooting. Most of the time, we had two cameras so it was great. When we were editing it one day, I remember I got into the editing room and I said, “Who shot that?” and it was archival. When we got lost, we realized that we were actually achieving something very interesting. It happens all the time when we show the film and people don’t know what we did and what we didn’t do, and that’s fantastic. It’s an evolution and that’s just great. What was the biggest challenge of portraying this character and preparing for this role? Bernal: It’s always a challenge, any role. But for this one, first of all, the Chilean accent was a big challenge, and then, getting into the skin perhaps of all the people and the time (era) and what happened more or less. There was the Cosmovisión in those days in Chile, and also the challenges that the character has. We wanted to create a character that had this “otherness,” this “foreignness” in his own country, which has to do with not only the exile but also with him working in publicity and looking at things in a little bit more childish and technical way. His lack of political rhetoric as well was something that was interesting and difficult to play in a very political movie. The scenes between the father and son, all the little things, were also a challenge. We shot a lot. It was seven weeks, six-day shoots, and non-stop with two cameras. Larraín: Two cameras and it was digital recording. We had hours of material. Bernal: The little kid, Pascal, (Pascal Montero who plays his son) was great, but he had such energy that we would be play fighting all the time, so it was quite exhausting. (Laughs) He’d say “Action!,” and then he’d be like “Bop bop bop bop” on the floor. He wouldn’t stop doing luchitas. How do you say that in English? Your character, René Saavedra, was a composite of two real men, was there any added pressure to portray a composite character based on real people? Bernal: The experience that I’ve had playing characters that are not here with us anymore, like Ernesto Guevara, for example, was more pressure than this, especially because of who he was and the iconic mythology that surrounded him. That was a lot of pressure. But that’s another story. In this one, the characters are very much alive and they are the first ones to know that this is a fable. This is an interpretation. It isn’t even about what they want to be shown, because obviously Pablo and his whole team were involved with them in the investigation, talking and trying to find out what the story is. They were aware that this is a story to let go in a sense, because ultimately, this film was made by the heroic feat of the Chilean people. This is out there to be interpreted and to be done. Pablo did a fantastic job and also risked a lot getting into the body of something that has to do with our recent history. This is one of the best exercises that I’ve seen, and I think only in Chile can it be done because in many other countries it would be much more complicated. Pablo has done a great job in reconciling not with history, not with the political past, but with the people who participated who have now reconciled with themselves as a result of this story. It doesn’t have this messianic kind of “from now on, after doing this film, we’ll all have a fresh start and understand what happened.” No. I think it’s more of an experience for all the Chileans who lived through that, to experience that again within themselves, and nowadays where we’re standing, and to have their own reflections on it. Also, [it’s an opportunity for] the kids who weren’t alive then to understand a little bit about what happened and to be part of that exercise of memory, which is something that is so necessary, not only in Latin America, but everywhere in the world, and to be aware of what happened and to interpret it and reflect on that, and what better way to do it than in a fiction. We could have carried the whole weight and said that this is a documentary or this is exactly how it happened, which can be argued because one third of the film is stock footage, archive footage, but that wasn’t the intention. It’s a fable. It’s a fiction. And therefore, the film can speak to more angles and can cause more shivers. How is your film playing in Chile? Bernal: It’s still in cinemas. It’s still in a couple of cinemas. It’s very popular. Three ex-presidents came to the premiere. It’s the topic of discussion, of course. Bernal: Pablo’s downplaying it a little bit. It was actually a huge success. Big time. Larraín: We had a very good box office and we had a national discussion around the film for a couple of weeks, not only on the movie but also about the referendum issue. It just refreshed and brought the subject back to the media. It was interesting from my personal perspective, what I liked most is that the people who actually did the campaign are finally being recognized. They were known people but now those guys are really on the covers. At the beginning, it was Gael and the Chilean actors who were part of the cast, but the second week when the movie was like “OK, let’s talk about the subject,” it was the guys who did the campaign, the characters that were referenced when we created Gael’s character, the real persons, they were on the front page. That was just fantastic because they got this recognition 25 years later. In fact, they’re traveling now around the world showing their support of the movie in different places, in London and in Argentina. Everyone’s moving and spreading the word about the movie. It’s fantastic. It’s like they got a medal. They got it late, but they got it. When the movie came out in Chile, how did audiences react? Larraín: We got every single possible reaction, from extremely positive to the worst reaction. Every possible thing that you can imagine has been said about this movie in my country. Larraín: All of it. We had people saying that this was a creation from the international left wing that’s trying to destroy Pinochet, and people from the left saying this was created by the right wing to prove that the capitalist system is something that is okay. It’s like you read all this and then you say, okay, this is cool. Everybody has a different opinion. And then, from the cinematic perspective, it was chosen the best Chilean film of the year. They chose us to represent Chile in the Oscars and it got the Critics Circle Award and then the Academy Award nomination for Best Foreign Language Film. So it got pretty good recognition on an artistic level. It did very well at the box office, and then we had this discussion, so I couldn’t ask for anything more for a film. It’s fantastic. Bernal: What’s also great about the movie, just in cinematic terms, is that it speaks to this freedom that we’re experiencing in Latin America where you can grab a camera and just start doing a movie. You don’t need too much of an organization behind you. You need to have rigor, but you don’t need this huge amount of infrastructure to be able to do a movie. Larraín: You have all the responsibility in the end. Bernal: Exactly. Then, there are no excuses in a sense. You can do a good movie with very little means. We used to strive for good quality, such as good image quality, and like Pablo says, these cameras that we shot No with have less resolution than an iPhone. It’s no longer an excuse in a sense. What I like about this movie is it’s a really good movie that never loses its rhythm but carries you out. It’s done using the worst material but it’s just fantastic. It looks incredible. It looks nostalgic nowadays for us. This is how we saw TV when we were kids. Now having a nomination is like “Wow!” It’s gotten into the formal, stereotypical industry in a sense. It got into the structure, but at the same time, it was done completely against the rules of that structure. You ask anybody who shoots a film with this material and everyone says nobody is going to see it because nobody wants to go to the cinema to see a movie made like this, which is not true, of course, because filmgoers want to see a film just because it’s good. It doesn’t matter how it’s done. It doesn’t matter if it’s only two tracks in the sound. It doesn’t matter if there’s no dialogue. It doesn’t matter if it’s black and white. A good movie is a good movie, but it’s a risky thing, of course, because you’re risking a lot. But once a great movie is there, it just flows. As this is the last film in a trilogy, do you think that you’ll look for projects in the future that have a political message or do you think you’ll do something lighter like a romantic comedy? Bernal: Lord of the Rings or another trilogy. Larraín: I think every film is somehow a political film. You show a perspective and a world that has logic, and that logic is inserted into a political environment, and it means something. Yes, why not? I’m open to doing whatever feels right. What I do know is that I’m not going to make, not now at least, another film about the recent past of my country. I’m done with that for a while. We’ll see. I did three in a row. I’ll just try to find something new. Bernal: How about the future? Larraín: (laughs) Yes. A futuristic movie. When you made this movie, did you expect it would resonate all over the world? Were you surprised to get an Academy Award nomination? Larraín: No, this movie was made in a very private, quiet environment without any sort of projection or pretension. We just did it. We became friends and we had a great time while we did it, and then the movie got into Cannes and it’s just been super successful. We never expected it. It would be ridiculous to expect a nomination while you’re shooting or thinking about a movie. If it happens, wonderful, and as Gael said, the movie is going to be seen by more people probably. It will reach a wider audience, which is fantastic, but you never really expect anything. At least I never do. Bernal: When I was doing Amores Perros, I asked the producers to give me a VHS copy afterwards. On the last day of shooting, I said, “Hey guys.” I just forgot. I didn’t even have a contract to do the movie. But I told them, “Just one little perk. Would you mind giving me a VHS when the film comes out just so I can show it to my family?” This is more or less still how it is nowadays. I mean in the sense that now there is a chance that the film will come out in the cinema, but back in those days it wasn’t even a chance that my family was ever going to get to see the film in the cinema. So it was like, “Can I have a VHS copy?” And then, next thing it won at Cannes and it was like, “Ahhhhh!” You never expect those things. It’s good to not have that pressure.